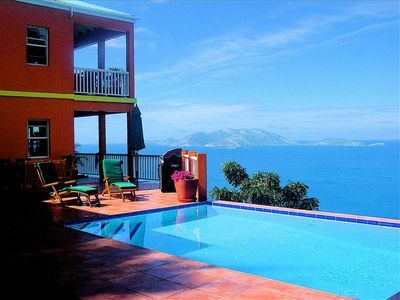 A wonderful luxury secluded property within a private hillside estate overlooking the beautiful Long Bay Beach. 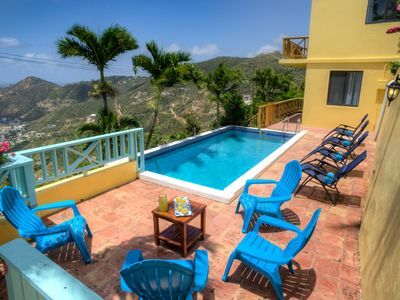 This Caribbean villa rental has 2 pavilions which offer spacious living and plenty of deck space for you to relax, sunbath or whatever your pleasure is. Alfresco is a new property which has been finishes to a very high standard. 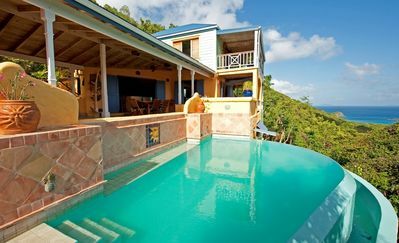 The swimming pool with virtual infinity edge offers a panoramic view of neighbouring islands Jost Van Dyke, Sandy Cay and onward to other Virgin Islands. 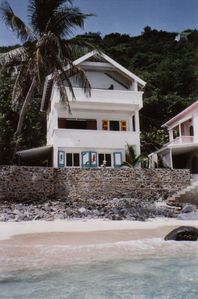 A fantastic vacation rental Caribbean property to enjoy your stay. 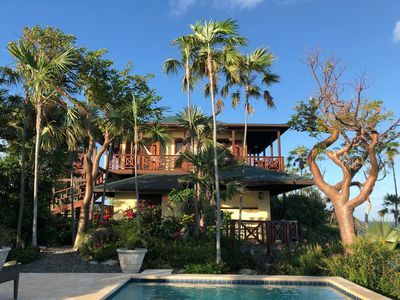 You will enter the property through an imposing mahogany door into a mezzanine level which adjoins the living room with stunning views out to sea. Sweep down the curvaceous staircase into the living room and relax into one of the sumptuous sofas. There is a vast selection of channels on the 38” satellite TV, a good selection of DVDs can be watched on the Blu-Ray DVD. The music system is right there too if you prefer some music to listen to, either using your own ipod/iphone or something from our collection. 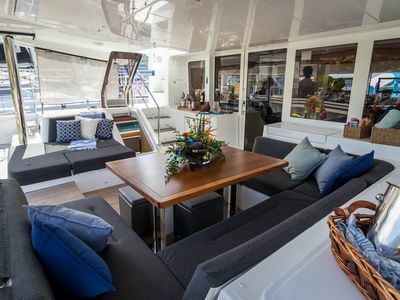 The wonderful main deck is right outside where you can enjoy the fabulous vista, take a dip in the pool or simply enjoy Alfresco living with lunch around the table. The mezzanine leads you to the Kitchen with its well appointed high end units with granite counter-tops and stainless steel appliances. Even the kitchen sink is a great place to look out at the amazing sea view. Should you need any provisions for your arrival just let us know and this can easily be arranged. 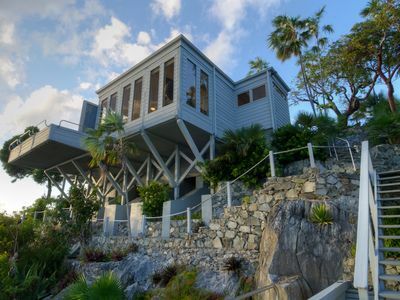 The Dining Room beacons you from the kitchen with its majestic views of the islands. The glass and stone table is bespoke in this open air pavilion and gives a nice airy feeling to your dining experience. The dining area is also a great place at night which provides an elegant setting for dinner, whether you are cooking yourself or if you decide to bring a chef in. From the Dining Room you have easy access down a curving opening arms staircase to the splendorous main deck, planters are filled with local palms, bird of paradise, heliconia, gingers and bougainvillea. 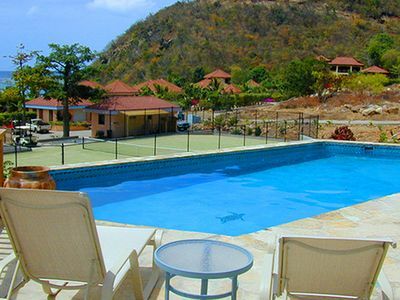 Once at the pool, take a dip, enjoy the views and relax in the sun on the comfortable sun beds. An outdoor shower is on the deck. 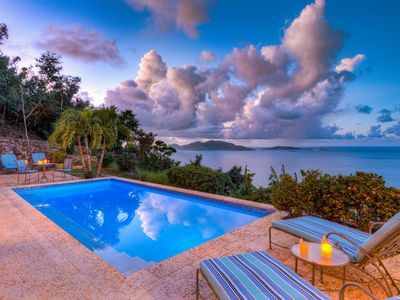 In the evening enjoy this area with a cocktail, watch the sun go down, marvel at the fabulous pool colour sequences (programme your personal colour favourites). You might want to rev it up a bit, put on some music and have some friends over you have met during your stay. 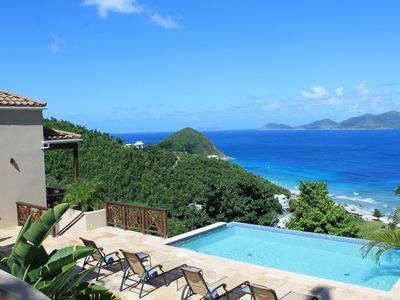 Alfresco villa Tortola is the place to stay. All rooms have large sliding doors which disappear into the walls to open up the house, this offers open plan living and complete flexibility to move around Alfresco with ease. Plenty of books are available, if you don’t finish one take it home, please leave one in its place so the next guest has some reading pleasure too. Board games are provided for an evening in. The bedroom pavilion offers an upper level Master Suite. 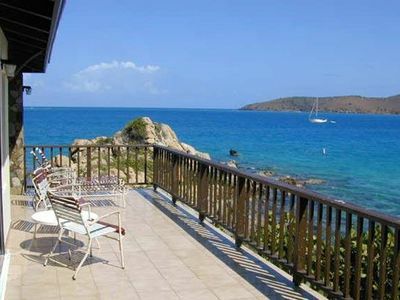 This has beautiful views of the islands and beyond from the balcony and spacious outdoor private deck. The bathroom is finished with a gorgeous stone Travertine and natural pebbles, the oversized shower offers you an invigorating experience. You can marvel at the wonderful wood ceiling as you look up from your king size bed handcrafted in reclaimed teak from Bali. You will be sleeping under Egyptian cotton percale which will give you a luxurious night’s sleep. If you stay in October, there is a wonderful Jacaranda tree full of cotton like flowers which cascades over the outdoor private terrace leading out from the bathroom. 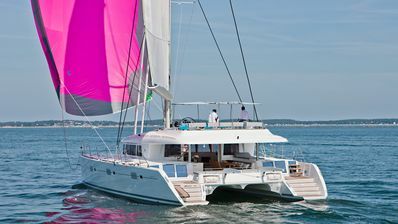 The second bedroom can be found at deck level and offers comfy easy access. 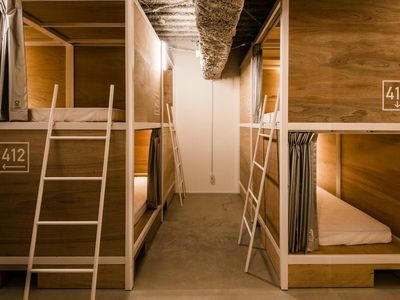 You can choose either twins or a king size bed for this room depending on your needs. Same Egyptian cotton for that perfect night’s sleep. Again this bathroom is finished in lovely stone Travertine and natural pebbles with beautifully bespoke mill work in the bathroom. 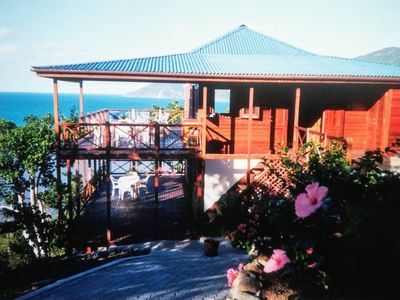 The private wrap around deck can be used as another area to relax and enjoy your stay. We have an extra single bed if this works better for a family stay or perhaps a 7th guest. The third bedroom is very private and leads down from the main deck via steps to an outdoor space overlooking trees and landscape. You can enjoy the sea views and ocean sounds at night if you wish to. This bedroom has a low 4 poster Queen Bed with local art work to give a contemporary feel to this space. Again luxury Egyptian cotton is featured throughout the property. Bathroom is finished with stone Travertine and natural pebbles in your lovely spacious walk in shower. Enjoy the privacy of this bedroom. 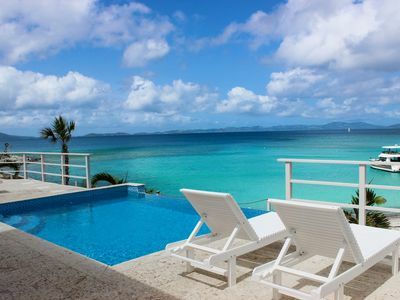 This property is easily accessible to Long Bay Beach if you want to drive or walk, up to you. Smugglers Cove is around the corner (need to drive) unless you are fit! 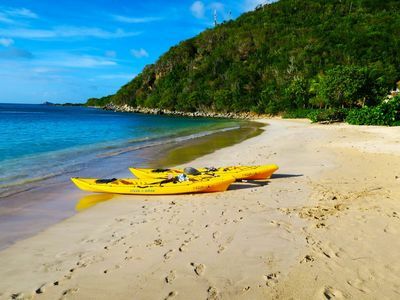 There are local restaurants within driving distance of the property, Long Bay Beach Club and Tropical Fusion are the nearest, Sebastian’s is just over the hill, you have The Sugar Mill restaurant just on from that and other local eateries. If you go to Sopers Hole you also have a nice friendly local restaurant where you can watch the sailors coming in after a day at sea, you can also look around the marina and see all the larger yacht’s moored up for the night. 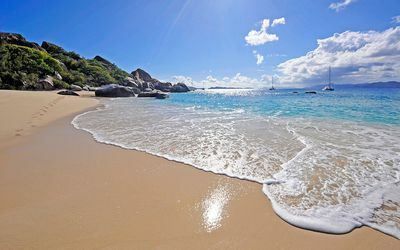 A nice place to relax. You can also get a great breakfast here with D-cup coffee shop. 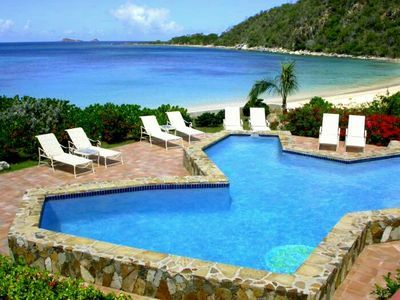 Overlooks Long Bay Beach, neighbouring islands Jost Van Dyke and Sandy Cay. 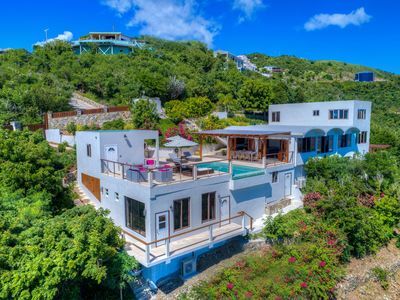 Private hillside estate easy access to beaches, restaurants, shops & bars. 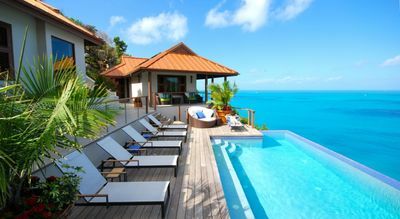 Alfresco is one of the best of BVI villas.